Elliot Sharp is a frighteningly prolific musician. Based in New York and actve in primarily the avant-garde realm, he has released over 200 records with no end in sight. 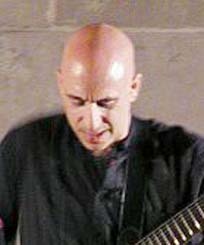 His instruments of proficiency include various types of guitar, as well as soprano saxophone and bass clarinet with which he utilizes a circular-breathing technique. His compositional style has occasionally made use of fractals.